Max Ht = 387, total L = 620; seat L = 445, seat W = 29, seat th = 24; leg diam = 16.5 to 20 mm [RTS 3/6/2005]. Headrest carved from a single piece of orangey brown wood (Pantone 729C) . This is an example of 'found form', with a naturally grown branch specifically chosen because its shape, with subsidiary branches coming off the main stem to form the three feet, was suitable for making a headrest. 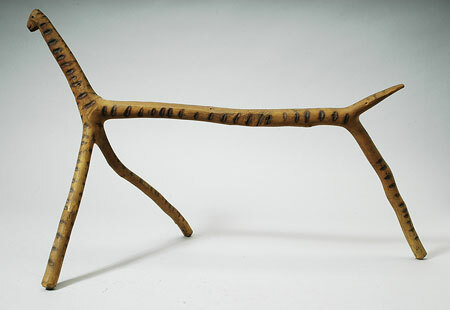 This example has been made to imitate an animal, possibly a giraffe. It consists of a narrow seat running horizontally across the top and almost straight across its length. The upper surface has been partially flattened along the front half of the seat, leaving it with defined sides and a slightly convex surface across the width; the back part of the seat still follows the natural curve of the original branch. This has a convex underside throughout. At the front of the seat, a branch angles out and up to form a long animal neck, flattened across its back, and terminating in a small triangular head with pointed crown. Small holes have been burnt into the surface of this to create eyes and nostrils, with a slit mouth cut below. A shorter, tapering branch forms a projecting tail from the back of the seat. 2 branches extend from the underside of the seat to form the legs, consisting of a thick branch at the front that forks almost immediately into 2 splaying legs, in an inverted 'Y' shape, and a single branch at the back that is in alignment with the seat body. These legs have uneven, faceted feet. It has been decorated across the body with a series of short lines, burnt into the surface using a heated tool. These run in columns down the outer faces of the legs, down either side of the seat and across the top of its rounded back part, across the top of the tail, and all around the neck. The headrest is complete and intact, but with some splits along the neck and seat area. It has a weight of 592.3 grams and is 387 mm high and 620 mm long; the seat is 445 mm long, 29 mm wide and 24 mm thick, while the legs have a diameter of from 16.5 to 20 mm. Collected by Rowland Percy Somerset Elderton in 1909; donated to the Pitt Rivers Museum in 1952. This is said to be a man’s headrest, used to keep the elaborate Shilluk hairstyle intact, “ The men wear their hair long and worked into a cone with a sharp point by means of cow dung and urine, constantly renewed. The head-rest prevents the sharp point being blunted during sleep” (information provided by the collector in a letter dated 27 April 1952). For a similar headrest, see 1961.9.4, attributed to the Shilluk. This particular example is very tall, and may have been made as a piece of 'tourist art' rather than for actual use. Card Catalogue Entry - The card repeats the accession book entry, with further data 'coll. by donor 1909' [RTS 2/2/2004]. Related Documents File - Elderton contacted the museum to propose donating some objects in a letter dated 1 January 1952: 'It has been suggested to me by Mr. Coghlan of the Newbury Museum that as you have a considerable number of Sudan exhibits you might perhaps like to have all or some of the following items which came into my possession during my Service in the Egyptian Army from 1903 to 1925.' This object was not mentioned at that time, but appears in a second letter of 27 April 1952: ' ... You will see from the following list that I have added several items since I first wrote to you. ... From the Atwot Tribe (on the Sobat River which flows into the White Nile from Abyssinia) in 1909. A/ A Man's Head Rest. The Men wear their hair long, worked into a cone with a sharp point by means of cow dung and urine, constantly renewed! The rest prevents the smart point being blunted during sleep! ... I have made out the foregoing formal Inventory as your authority for your additions to your Catalogue, in case somebody should ever challenge any item. I have heard of such incidents occuring elsewhere! ...' [MOB 5/2/2002]. Pitt Rivers Museum label - SUDAN: ATWOT TRIBE (on R. SOBAT). Man's headrest. 1952.5.60. d.d. R.P. ELDERTON [circular metal-edged tag, tied to object; RTS 26/5/2005]. Sparks, Rachael. "Atuot headrest" Southern Sudan Project (in development). 03 Jan. 2006. Pitt Rivers Museum. <http://southernsudan.prm.ox.ac.uk/details/1952.5.60/>.